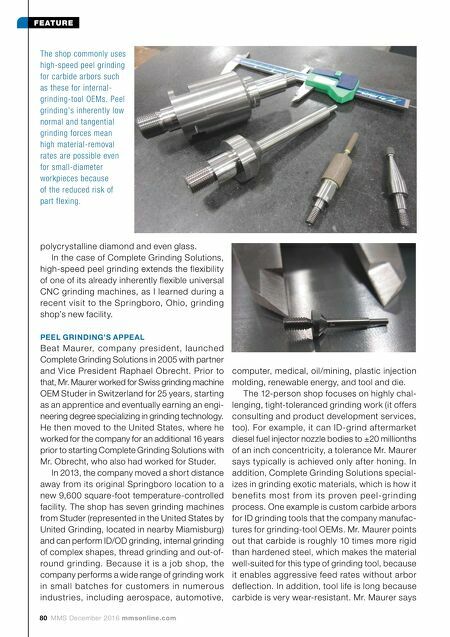 mmsonline.com December 2016 MMS 81 FEATURE peel grinding the outer diameter of carbide arbor takes just a few minutes compared to approxi- mately 20 minutes using conventional, lower speed grinding processes. The machine the shop uses for high-speed peel grinding is a Studer S41 universal cylindrical grinder. Mr. Maurer says this machine can perform a variety of operations, including ID, OD, cam, thread and out-of-round thread grinding. It also offers sufficient rigidity and features design ele- ments that make it well-suited to perform high- speed peel grinding, including a Granitan S103 mineral-cast machine bed, which is said to offer better vibration damping and more stable thermal characteristics than conventional cast iron beds. In addition, the S41's StuderGuide guideway system has longitudinal and cross-slides that are made of gray cast iron and molded directly into the machine base. They feature ground surfaces finished with a wear-resistant Granitan S20 0 material to enable high load capacity and provide additional vibration-damping qualities. The slides are powered by linear motors having direct mea- suring systems with a resolution of 10 nanometers. Mr. Maurer says that when this machine is set up for peel grinding, it can achieve material-removal rates upwards of 50 mm 3 /sec./sec., whereas conventional, lower speed cylindrical grinding processes commonly achieve material-removal rates ranging from 2.5 to 5 mm 3 /sec./sec. Peel grinding differs from plunge grinding with a wide, profiled wheel. As with turning using a single-point tool, peel grinding maneuvers a thin wheel in X and Z a xes to completely grind the profile of a par t. Therefore, a single wheel can grind a variety of diameters, contours and other features. Programming isn't terribly daunting, either. Mr. Maurer says point-to-point program- ming can be performed at the machine for basic profiles, while StuderWin Contour software can be used for more complex geometries. In most cases, there is no roughing pass fol- lowed by a finishing pass. Typically, one heavy cut takes care of all necessary material removal while leaving behind a quality surface finish. Looking at the wheel profile drawing on page 82 shows why. T h e s e w h e e l s a re t y p i c a l l y 5 - m m w i d e a n d 400 mm in diameter. The face of the wheel has a 10-degree lead angle where roughing/material removal is performed followed by a flat profile that provides a quality ground finish. Therefore, one pass of the wheel performs both roughing and finish-grinding. Most wheel wear occurs at the corner where those two areas transition, meaning the wear rate is essentially the same whether shallow or deep grinding passes are made. The shop primarily uses metal bond wheels from Tesch, located in Germany. THROUGH-COOLANT GRINDING WHEEL DRESSING Complete Grinding Solutions often uses CVD diamond dressing plates with internal cool- ant delivery like the ones shown here from Switzerland's Diamant Weber. ( The shop also sells these and other diamond dressing tools as a distributor for Diamant Weber.) 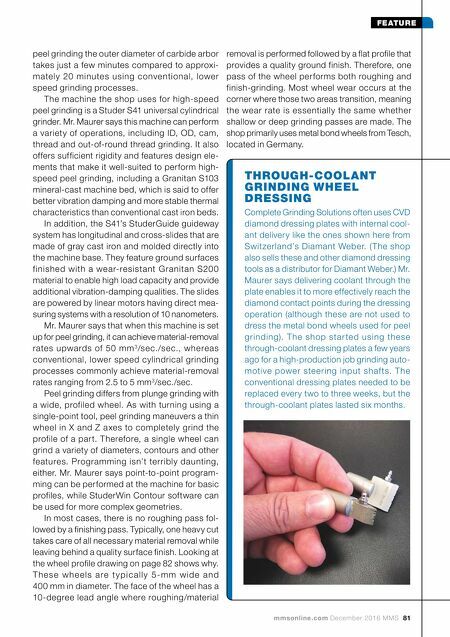 Mr. Maurer says delivering coolant through the plate enables it to more effectively reach the diamond contact points during the dressing operation (although these are not used to dress the metal bond wheels used for peel grinding). The shop star ted using these through-coolant dressing plates a few years ago for a high-production job grinding auto- motive power steering input shaf ts. The conventional dressing plates needed to be replaced every two to three weeks, but the through-coolant plates lasted six months.